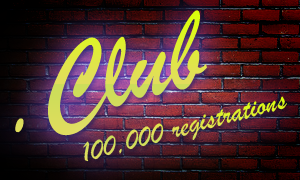 Among the new generic TLDs, .CLUB is the first to have 100,000 domain names registered in just over 100 days. Approximately 200 to 400 domain names under .CLUB continue to be registered every day. Currently number three on the nTLDstats.com’s list for most domain names registered, the .CLUB extension has not resorted to promotional campaigns to gain registrations. The top two domains, .XYZ and .BERLIN, have reportedly given away domain names during their advertising campaigns, with as much as 81% of all domains registered in the case of .XYZ who have been offering equivalent domains to .com domain holders. In the case of .BERLIN, around 90,000 domains have been registered during a promotion with a large number of domain names being allocated free of charge. Since its launch, the .CLUB extension has continued its streak as one of the best-selling new domains attracting entrepreneurs, corporations, brand owners, popular entertainers, domain investors and other entities globally that could call themselves clubs – public, private, commercial or elite. With a .CLUB domain name you can enhance your online presence and distinguish your club’s virtual identity. Just click the extension to check if the name you desire is available for registration. Should you need help or have questions, please contact our Support Team at support@web-solutions.eu or via phone on +44 (0) 208 133 3994.